With recent cases of open carry being debated and argued in court and legislatures, namely Mississippi and Arkansas, one might question what the big deal is. Depending on your mindset you might question what the big deal is one way or the other. There are the anti gunners who seem to crap their pants at even the THOUGHT of someone with a gun on their hips who would prefer to watch someone club a new born child to death and call it a really late term abortion than to see someone exercising their 2nd Amendment rights. Then there are the pro gun people who, sometimes fanatically, rail against the practice of open carrying for a myriad of reasons from tactical disadvantage to “you’ll ruin it for everyone”. On the flip side you have the average OCer who just prefers that method to carry or doesn’t have the option to CC because they are in a state that doesn’t recognize that right. Then you have the militant OCer who feels that everyone who doesn’t OC is a coward and is letting the terrorists like Obama and Bloomberg win. Suffice it to say, I’m a guy who just prefers to open carry. I don’t wear clothing conducive to concealing a firearm and I don’t carry firearms conducive to hiding themselves. Also, my Pennsylvania LTCF leaves a lot to be desired in regards to reciprocity, especially when we have an State Attorney General on the record as making it her goal to rescind as many reciprocity agreements as she can politically get away with. So, sometimes, I find myself in a state that I have no option but to open carry or go unarmed. I choose the former. But what does open carry do to the environment around you? Initially, 6 years or so ago when I started OCing in Pittsburgh the cops would occasionally be called, sometimes I’d be thrown in cuffs because (since i wasn’t doing anything wrong) I would refuse showing them my “papers” like we just stepped through a time warp to 1938 Germany. But, overtime, as the citizens of the city and the state (no, it wasn’t all me) got accustomed to seeing non government people carry firearms openly the mystique and “scandal” of firearms began to wane. As much as the anti gunners still want to beat the dead horse of “Old West” this and “Shootouts at high noon” that, the truth is that open carry is legal in some form in 44 states and blood does not run in the streets. For that you have to go to gun control havens like Chicago or DC. Yet, even though 44 states allow some fashion of OC, the populace in many of these states have been conditioned to be fearful with childlike terror at the near sight of a firearm on someone without a badge. To the point that there are stories of grown women weeping at the thought of even touching a firearm the first time they go to a firing range. Putting aside tactical advantages or disadvantages, sometimes the boat needs to be rocked. I’m not saying OCer’s should walk around and figuratively shove their guns in peoples faces, but if an OCer is going about his or her day, just livin life, eventually the liberal gun grabbing fear conditioning will slowly ebb away. That has been my experience, not only in Pittsburgh but also on my recent travels across this country. Stopping in Nevada, Utah, Nebraska, Iowa I went about into the cities and towns with my six shooter on my hip. No one batted an eye save for two instances in Salt Lake City. The first from a small family that I passed walking on the sidewalk. The husband remarks to the wife discreetly, “Look, they allow regular people to carry guns here”. More of a statement of curiosity than an indictment from these tourists from I assume California. The second was at a restaurant I went to, Red Rock, where one of the managers came to me after I finished eating and asked if I would explain the legalities of Open Carry in Utah. For those of you who don’t know, to OC without a permit in Utah the weapon must be at least two actions away from firing. For pistols that means, rack the slide then pull the trigger. We had a delightful little conversation. That’s it. 4 states, 1000 miles or so and no views askance or tsks tsks. Imagine what the results would be if I went through Massachusetts, Connecticut, New Jersey and Maryland. I’ve little doubt cops would be getting called on me all day even though it is just as legal in those 4 states to OC as it is out west. But there it goes. No one Open Carries in those states. And if they do, too often people overreact and the OCer is arrested and railroaded simply for exercising a constitutional right. It is at those times that the need to open carry is GREATER. Yeah, it’s cool that I can head west over the Mississippi and not have an issue with OCing until I hit the coast but if we continue to allow the notion that “GUN = EVIL” to persist by keeping our sidearms hidden then the uninitiated will accept that as a truth. So when it comes election time and gun grabbers are looking to make inroads to infringing our rights, those same uninitiated voters only think that criminals have guns. 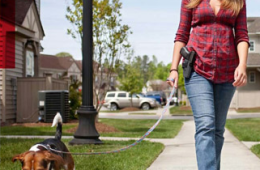 Perception to them is reality, if they don’t see regular people carrying guns then to them regular people DON’T carry, so what does it matter if the AG wants to gut the CCW program, or why should they care about Constitutional Carry etc etc etc. A Right unexercised is a right lost…but a right exercised only in secret will be lost just as well by those who don’t know the secret.